Orthomolecular medicine describes the practice of preventing and treating disease by providing the body with optimal amounts of substances which are natural to the body. Two-time Nobel Prize winner, and molecular biologist, Linus Pauling, Ph.D., coined the term "Orthomolecular" in his 1968 article "Orthomolecular Psychiatry" in the journal "Science". Pauling described "Orthomolecular Psychiatry" as the treatment of mental disease by the provision of the optimum molecular environment for the mind, especially the optimum concentrations of substances normally present in the body. 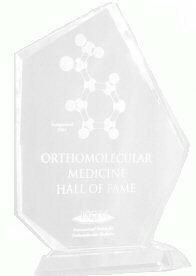 Orthomolecular is a term made up of ortho, which is Greek for "correct" or "right" and molecule which is the simplest structure that displays the characteristics of a compound. So it literally means the "right molecule". Pauling later broadened his definition to include orthomolecular medicine, which he defined as "the preservation of good health and the treatment of disease by varying the concentration in the human body of substances that are normally present in the body". He stressed the adjective orthomolecular is used to express the idea of the right molecules in the right concentration. Pauling firmly believed that daily supplementation of vitamins in optimum amounts, in addition to following a healthy diet, was the most important step that anyone could take to live a long and healthy life, and by following his own advice, he lived productively for 93 years. "Professor Pauling as always is ahead of his time. The latest research on vitamin C substantiates his twenty-five years of advocacy and investigation on the benefits of vitamin C." J. Daniel Kanofsky, MD, MPH, Albert Einstein College of Medicine.